Thinking about implementing a Business Intelligence (BI) solution, but aren’t sure how to navigate your way through an increasingly noisy business analytics software industry? Relax. We’ve got you covered. Check out the recording of our recent Webinar series – The real-world state of the BI market. Discover the inside knowledge you need to ensure BI and analytics success. And the best bit? It’ll only take 30 minutes of your time. We’ve even uploaded the slide deck – created and delivered in Yellowfin’s very own Storyboard presentation module – to Slideshare; allowing you to move through the presentation at your own pace. And, we’ve included a downloadable PDF version, making it even easier to share with colleagues and friends. Listen in as we dissect the results of Dresner Advisory Services’ (DAS) 2013 Wisdom of Crowds Business Intelligence Market Study – the BI industry’s most in-depth research report into major global implementation, usage and technology developments. If you’re thinking of deploying BI, you need to see beyond the hype. Take advantage of our expert analysis and explanation of the industry’s most prevalent, tangible and relevant trends. 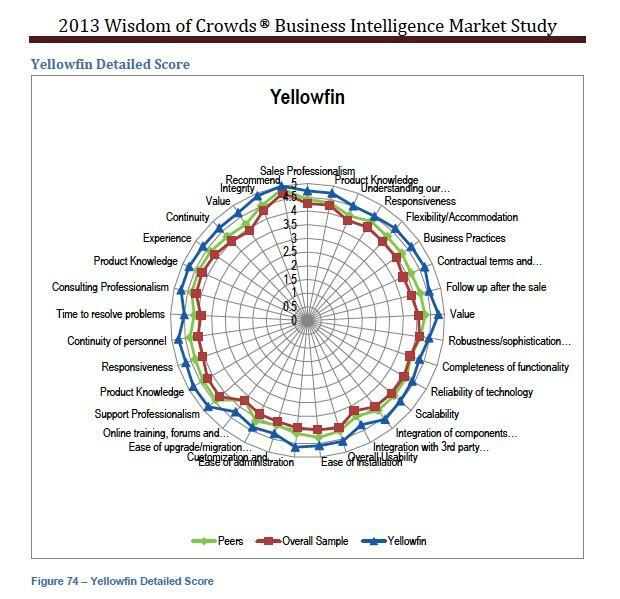 "Yellowfin’s unmatched performance in 2013’s wisdom of crowds study underscores the success of our consumer-oriented approach to the BI market. Not only do these outstanding results reflect the quality experience enjoyed by our customers, they also demonstrate Yellowfin’s ability to deliver unrivalled product, services and support."